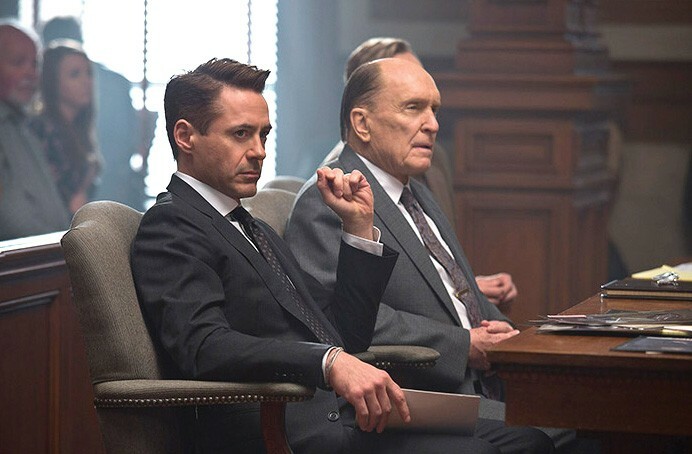 ONE ANGRY MAN There is Oscar chatter around Robert Downey Jr.'s performance in this courtroom drama. Embittered high-end attorney Hank Palmer (Robert Downey Jr.) returns to his practically perfect home town of Carlinville, Ind., for his mother's funeral. Palmer intends to leave, but that's when his father, Joseph (Robert Duvall), a judge of some 42 years standing, is arrested for a hit-and-run accident. Evidence suggests Joseph had a personal motive for the accident. The accused judge needs the best lawyer he can get . . .
All this is mitigated by one fine cast. The Oscar-bound Downey, leading them, demonstrates lashing impatience and bursts of intelligence, and proves that so much of what we describe as great acting is just a matter of clearing air fouled by the smell of moldy corn. Duvall is at home with the role's stubbornness and graphic physical decay. Vera Farmiga, as the tattooed girl Hank left behind, is a Howard Hawks type who likes to start things first. She's too good to be true, but she's a hotshot. A pleasure that they didn't go for the manic pixie, as usual. And in this relentlessly patriarchy-pampering drama, Farmiga gives the movie some physicality, some common sense. She's just about the only female in the film, if you don't count Hanks' studiously cute little girl. Thomas Newman's soundtrack is unnoticeable until you notice it—which is a good way to furnish such a drama. If some of the driving scenes are shot like car commercials, with the prop wash from the camera copter ruffling the corn fields, Dobkin's people found a fairly ravishing hamlet to shoot in, and cinematographer Janusz Kaminski burnishes the locations. "Indiana" is played by river town Shelburne Falls, Mass., which works well for us in California. During a serious drought, you start to crave even the look of water. 'The Judge' is now playing in wide release.